A ‘Matilda’ is a bushman’s bundle of possessions carried when traveling. It’s also the perfect name for Oak Cliff Seed Preschool’s movable classroom, which just so happens to be a bundle of school supplies inside an area shaped like a bus. 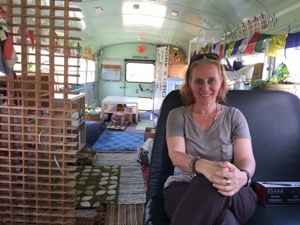 Actually, it is a bus – a fully working re-modeled and re-painted previously yellow school bus that owner Jennifer Stuart, 52, fittingly named ‘Matilda’. 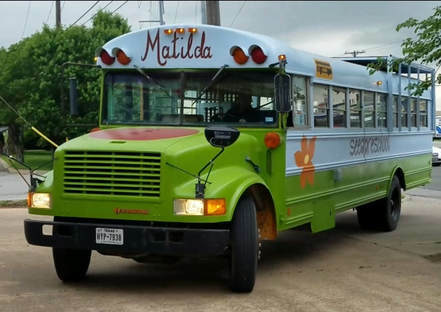 Once parked, Matilda serves as the creative gathering room for up to seven curious 3-6 year-olds. but Matilda’s not really why the parent’s of these children have chosen this rather unique preschool. It’s what’s outside the bus that brings everyone there. Most weekdays Stuart parks Matilda at the Twelve Hills Nature Center. Once her students arrive (with no electronic tablets, phones or laptops) and settle in, they join their teacher outside the colorful vehicle for a fresh-air session of “trail hiking, collecting, observation and documentation”. Nature is the main course taught and adored by Stuart, and she’s discovered an ideal location to share her life-long passion with children. 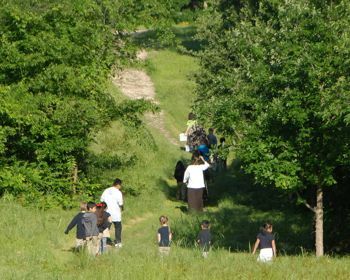 Located on 20 acres of land previously occupied by 12 apartment buildings, the nature center is a “carefully planned and maintained urban nature preserve” that makes an ideal setting for learning about the outdoors. That means no typical plastic and metal playground, which is just fine with Stuart. The Seed Preschool students get to safely enjoy the unpredictable natural materials and surfaces that Mother Nature provides. A giant fallen tree branch becomes their seesaw. 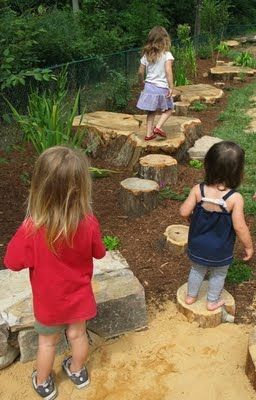 Five tree stumps turn into a three-child jumping game. Sticks are magic wands and reindeer antlers. Butterflies and birdies and cloud formations transform into the lessons of the day. Hikes take as long as they take since the children are given the chance to vote for whether they move on. There is no scolding or yelling – the students are gently encouraged to talk out their differences. Timeouts at this school aren’t punishments. It’s a teaching style that took Stuart 25 years to develop. After studying Child Development at Brookhaven College, she taught at the Dallas International School and then started and directed her own program called the Community School of the Park Cities and grew it to 75 families. Stuart created the Farm to Market Workshop in 2014 when her daughter Claire was in high school, which consisted of a series of nature-based workshops at the Dallas Farmers Market and an Oak Cliff grocery called Urban Acres that has a tiny garden outside. Lugging school supplies all over the city became a challenge, though. 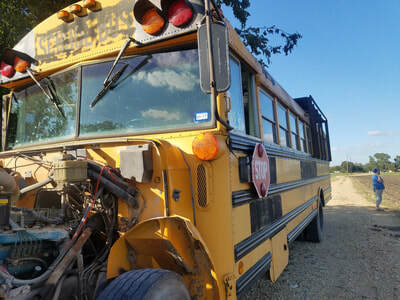 After some Craigslist shopping during the summer of 2016 she found a possibility, except this bus was three hours away in Round Rock and she had no idea (yet) how to drive such a large vehicle. By strange coincidence, the sellers were visiting their family that Thanksgiving in Oklahoma so on the way they drove the bus up to Dallas and parked it in front of Stuart’s house. The pressure to transform it was on. Wonderful friends who believed in her traveling schoolhouse dream pitched in to re-work and re-wire the engine, strip out the remaining seats, eliminate the three inches of dust that had collected in all the crannies, add a sink and a toilet and re-design and re-paint the inside of the metal bus until it looked like an actual classroom. Professionals stripped off the yellow outside paint and turned the top half of the bus sky-blue and the bottom half grass-green. Claire’s high school friend Honor Burns created the logo and the floating bees and butterflies on the side as well as the signature red tomato on the hood. Because it wasn’t transporting children, the bus could be registered as an RV and no CDL was required. At that point, the dream was almost a reality – but first the bus needed a name. Stuart jokes that she struggled more naming her bus than she did her own child, making endless lists of possibilities, none of which felt even close to correct. Then on a drive in east Dallas her eyes caught a street sign name, Matilda, and bells went off in her head. When she discovered what a Matilda means to a bushman, she knew immediately that she had found her new baby’s name and together in April of 2017 they officially became the Seed Preschool. But it’s what happens outside of Matilda that Stuart believes children need. For instance, in the springtime, if they see lots of caterpillars on a hike, they might raise some of them inside Matilda so they can watch them grow and change. That night, Stuart might go to the library so that the next day they can read books about caterpillars and discuss butterflies. Then when they spot those same insects on future walks, the children have a deeper understanding of how the nature they’re seeing works. Matilda allows children to re-discover the outdoors, and Stuart believes that’s the most valuable lesson her Seed Preschool provides. At the end of every day, the travelling veteran educator must somehow maneuver Matilda backwards around the parking lot’s one pesky tree and drive the big, easy-going schoolhouse back to her overnight garage on Irving Blvd. where Stuart’s bundle of treasured possessions will rest until the next day of learning begins. NOTE: A shorter version of this article was published in the May 2018 Oak Cliff Advocate Magazine.